There’s more to capturing a visually compelling image of a far-off mountain or a rushing river than pointing your camera and pushing the button. Chris Eyre-Walker offers his best tips for capturing the land around you. There’s nothing more rewarding than envisioning a shot, planning it and then – usually after multiple attempts – nailing it. That’s why I love shooting landscapes. Obviously on a short holiday you don’t always have the time to revisit a location on multiple occasions, so here are a few tips to help you get a better shot. Because it’s happened to all of us. That moment when we’ve stood in front of an epic view, looking out at it with a sense of awe, and finding when we get back that our photos don’t do it justice. Light worth getting up for. Nothing beats golden hour! Nothing beats the light of the rising or setting sun. Every landscape looks better during the golden hour – that time when the sun casts a beautiful yellow-orange light on the earth. If you can, and you should, get up early and get to your photo location an hour before sunrise. Why pick sunrise over sunset? Because the best landscape shots often happen at places – lookouts, waterfalls, beaches – popular with lots of tourists. If you can beat the crowds, do it! You won’t just get an amazing location to yourself, you’ll actually be able to enjoy the place much more knowing you’re seeing it as few other people do and, by the time the unknowing crowds arrive, you can leave with a big smile on your face. Obviously this requires a bit of research and some planning. A good landscape shot reflects this. At what time and where does the sun rise? How can you use that to come up with the best composition? Think about your location, do some research and work out what image you want to get before you get there, so you don’t waste precious shooting time phaffing around trying to work out the best angle to avoid the inconveniently located car park. Landscapes are all about showing the big picture. By using an ultra-wide lens, like the Olympus M.Zuiko 7–14mm f/2.8 Pro, you’ll capture the widest possible angle of your scene. The additional advantage of a wide lens is that it usually stretches the edges of your image and creates leading lines – the ones that pull the viewer’s attention toward the centre of an image – into the scene. If, for example, you’re shooting a big valley or mountain, try framing your shot with familiar-sized objects in the foreground to create depth. This will give the viewer an idea of how vast the forest, tall the mountain or deep the valley actually is when they see it off in the distance. To create an even stronger sense of depth and scale get down low or point your camera down a little and add a foreground into your image. Big Sur’s McWay Falls in the distance. Sometimes a five-hour wait pays off. Although not a big fan of adding too many extras to my camera, I find a polarising filter can make the magic happen. These filters screw onto the front of your lens and cut out the glare and reflections of the sunlight bouncing off anything shiny. They also add saturation to blue and green tones, making those turquoise waters and juicy green fields look exactly the way you remember them. This essential accessory will make those landscape shots pop. There’s nothing wrong with placing the horizon in the middle of the frame, but every time I see a shot like that I feel like I’m missing out on something. Is that straight horizon really what made this location so special? Were there beautiful clouds? Try pointing your camera up a little and place the horizon in the lower third of the frame. Got great texture in front of your feet? Move your lens towards the ground so the horizon is in the upper third of the frame. In either case you’ll immediately capture a much more dynamic shot and the viewer won’t feel like they’re missing out. Hallerbos in Belgium. During one week in spring the bluebells flower and turn this forest into a wonderland. Planning ahead is key. Remember how I mentioned getting there before the crowds? That doesn’t mean you shouldn’t bring someone along with you. Placing a person into a landscape shot can really emphasise scale, add a focal point and also make the location much more attainable. People see the image and immediately think, That could be me! Bonus tip: bring along a brightly coloured jacket to make the mate you’ve thrown in front of the camera stand out even more. Once I sat and waited for more than five hours to get the right photo. Why? Because it took me six hours to drive to this location then two hours to scramble down a thorny cliff to the ocean’s edge and I knew I wasn’t going to be returning anytime soon. With a promising sunset on its way I sat and waited, did a few test shots and compositions and waited until I got what I wanted. It paid off. Not only did I get a very unusual shot of a well-known location, but I also had a fun story to tell. Sometimes it’s worth waiting that extra minute for the things to align. It’s not over until it’s over. 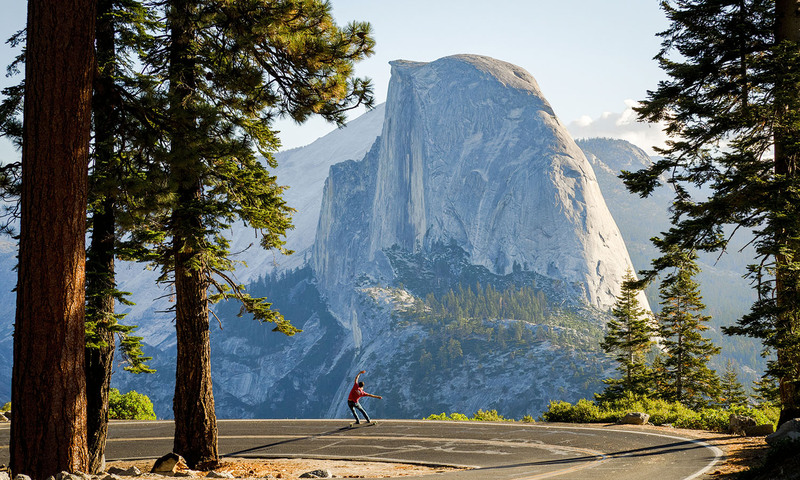 Putting the most iconic place in California – Half Dome in Yosemite National Park – into perspective..
Go beyond the car park. Anyone can drive to a viewing platform, hop out of the car and take a photo. The person who gets the better images will be the one who leaves their vehicle behind, hikes up a mountain and brings an added layer of story to the shot. It always makes for a more rewarding photograph. And, as always, have fun.